Heroes In My Closet: 'Ice to Meet You! More often than not, I was cold in the costume. When I knew I’d be appearing outside in a cold clime, I’d bring the thermals with me that I’d gotten at my first appearance in Vermont. Unfortunately, there were times when I didn’t know I was going to be outside until I arrived at a gig. Such was the case in Regina, Canada one winter. 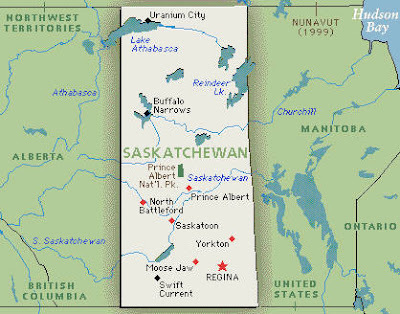 Regina is centrally located above the US border. It has two seasons: August and winter. I was traveling in January, so I knew the temperature would be in the double digits below zero. My actual appearances, however, were to be indoors at various gas station kiosks in the area. You know the type. Go in to pay for your gas before pumping and perhaps pick up a freshly brewed cup of coffee, a cold beverage, the newspaper, the latest bestseller or some candy and snacks. If your lucky, maybe a Slush Puppy, although I wasn’t betting on the Slush Puppy empire having a strong foothold in Regina. I had no reason to believe that the convenient kiosks at the gas stations in Canada would be any different, so I left the Spider-Man thermals at home. Key fateful-decision music. As expected, Regina was cold, –30˚ C or approximately 20˚ below zero Fahrenheit to us Americans. Like Winnipeg, the city was connected by a series of heated underground and aboveground walkways, because mere seconds exposed to the intense cold they experience for much of the winter risks inflicting frostbite to their skin. I don’t know how the locals got around pumping gas in these frigid temperatures. As with all gas stations, my appearance locales were stand-alone affairs. Worse, yet. They were situated in remote areas outside the city, remote flat, barren areas with nary a snow bank or bare tree in site for miles, giving the wind free reign to blow unimpeded across the plains. The “frozen tundra of Lambeau Field” that ESPN Sportscaster Chris Berman often eludes to was a patch of sand in Death Valley on a summer’s day compared to the places I was visiting in Regina. No worries. I’d be safely ensconced in the warmth of the convenience kiosks of the gas stations, nestled somewhere between the rack of Tim Horton Doughnuts and the Labatt’s Beer display. The news from my chaperone that I should already in uniform when he picked me up from the hotel and would be unable to take off the costume until the day’s appearances were complete, should have triggered a warning klaxon in my head that these kiosk visits would not be as I’d envisioned. I knew the schedule was tight—there were Spider-Man appearances set for a half dozen or so petrol stations (that’s what Canucks call ’em) consecutively with only enough time betwixt them to travel from one to the next—so I assumed the reason behind my inability to change into my civvies between visits was due to time constraints, not that there weren’t any bathrooms, or even closets, in which to change in the kiosks. Why? Because they were about as big a Mini Cooper. Technically, yes, I was indoors, but these petrol-station convenience stores were far from the snack food oases that I’d envisioned. They were more like Foto-Mats with doors on both sides that enabled the cold Arctic wind to whip through like a Ping-Pong ball in a vacuum tube. The only available space was directly between the two doors, which were no more than ten feet apart . . . if that. I was already shivering from the short trip from my ride to the first stop, breaking and re-breaking a land speed record each time I arrived. Yes, that red-and-blue blur was I. Had the doors remained closed, I might just have defrosted and only been terribly cold, but the locals came out in droves, keeping the doors open as they patiently waited to meet Spider-Man. 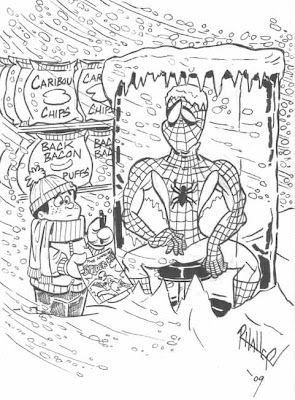 I couldn’t tell you much about Regina’s winter activities, but, given the residents’ enthusiasm to standing in line outside gas station kiosks in –20˚F temperatures just to get Spider-Man’s autograph on a free comic book, I’d say these people were starved for entertainment. I’d have been flattered if I wasn’t so busy trying to keep my eyes from crystallizing. And they followed me!!! I was on a tight schedule, an hour at each location, then approximately fifteen minutes to get to the next. Anybody who missed out at one station followed me to the next, where they were first inline to those already awaiting Spider-Man. It was like something out of Hoosiers with everyone in town following the team bus to the game. Like a traveling missionary, my flock continued to grow with more and more people overflowing to the next stop. I should have been running for the Canadian Parliament. Truth be told, I was incredulous. Not a single person complained. They were that happy to meet Spider-Man. I certainly wasn’t about to disappoint them, but I was freezing. I barely could hold a Sharpie never mind sign the comics. Relief came in the form of a gas station attendant’s jacket, the heavy, uncomfortable-looking affairs that mechanics wear in the winter of an indiscernible hue forever stained by oil and reeking of diesel fumes. I was loathe to cover the costume, but I had no choice. To keep my toes from chipping off, I’d remain hunkered on the chair so the coat draped over my entire body, keeping what little body heat I still had intact. Fortunately, a coat was available to me at each locale. My fans thought it was a hoot. Most were understanding, but there was the occasional jerk, who asked why Spider-Man needed protection from the elements. The suit absorbed the fumes, so I smelled of gas long after I defrocked and took a hot shower. I’m sure the Tin Woodsman would find it an alluring scent, but it was making me stoned. Still, it was better than getting frostbite.